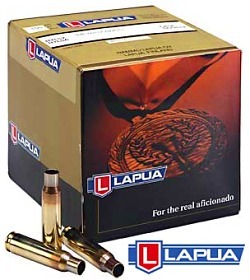 Lapua cartridge brass has been in short supply recently. The good news is that a large shipment (of various cartridge types) recently arrived, and both MidwayUSA and Grafs.com are now again showing quantities in stock. Yes, MidwayUSA has 6mmBR, 220 Russian, and .308 Win brass now. You may still have to check multiple sources, and if you wait a week or so, the brass should get to other discount vendors such as Powder Valley. Cabela’s has Lapua brass in stock also… but no 6mmBR or .308 Win. MidwayUSA now has Lapua 6mmBR brass at $82.99 per 100 (item 1270323515), 220 Russian brass at $97.99 per 100 (item 1270320316), and .308 Win brass at $72.99 per 100 (item 1270187523). MidwayUSA is also showing Lapua brass availability for: 20 Tactical, 222 Rem, 223 Rem, 7.62×39, 6.5 Grendel, 6.5×47, and 6.5-284, 6.5×55, and 30-06. Everything is pretty expensive — for example the 6.5×47 brass is $110.99 per 100 (ouch!). Grafs.com hasn’t posted all the new Lapua brass it has received yet, but today Graf’s is showing availability of Lapua brass for: 222 Rem ($49.99/100), .243 Winchester ($72.99/100), 6.5×47 ($91.99/100), 7.62×39 ($46.59/100), 30-06 ($89.59/100). We don’t believe Grafs.com received 6mmBR brass in this shipment, but they should get some by early April. If you still can’t find what you need, Cabela’s has the following types of Lapua rifle brass in stock: .243 Win ($69.99), 6.5×47 ($89.99/100), 6.5-284 ($99.99/100), 30-06 ($85.99/100), and .338 Lapua Magnum ($214.99/100). Lapua Brass Arrives at Vendors. Berger 105 VLDs at Bruno's. Share the post "Lapua Brass Arrives at MidwayUSA and Grafs.com"
Anyone wonder why the prices of the different .308 family brass differ so much? This proves that the cost of manufacture has little to do with market prices.